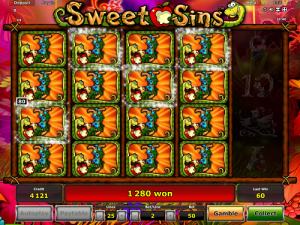 Sweet Sins is a new slot game from Novomatic that’s set in the Garden of Eden. The Garden of Eden was a paradise created by God. Legend has it that the Garden of Eden is the most beautiful place every created. Many people believe the Garden of Eden was mythical but some believe strongly in its existence and have even suggested some locations for it! In Sweet Sins slot, you can see the paradisiacal garden behind the reels. The grass is a thick, green carpet that covered the ground. There are bushes, trees and flowers that are flourishing. The design is quite cartoonish but it’s so much better than the regular, solid colour backgrounds! Both Adam and Eve, the first humans, are symbols in the game – as is the snake and the apple from the Tree of Knowledge! In terms of the actual game, there are 5 reels and 25 paylines. Sweet Sins has a payout percentage of 95.12%. Most Novomatic casino slot games are in that range but there are a few that pay out a little more (and some that pay out less). You can use Autoplay to make things easier and play hands-free. The game also has the gamble feature for players who like to make things more interesting and risk their payouts for a chance to multiply their winnings! The biggest payouts are handed out during the Free Games which you can trigger on any spin! Slot games similar to Sweet Sins have been made by over the years. The Wild Wood, Forest Guardian, Monkey’s Millions and Garden of Riches are just a few that also take inspiration from nature! Sweet Sins from Novomatic is a typical slot game! The symbols are the key to getting wins and multiplying your balance. In this slot game, based on the creation myth, there are 5 reels and 25 paylines that go from the left towards the right. You can see how they cross the reels by looking on the paytable. Each payline has an individual path and will only award one win per spin. Paylines award wins when identical symbols land on them, but only if they land from the left without missing any reels! In other words, the identical symbols must land from reel 1 and then consecutively. The biggest wins are awarded when the same symbol lands on every position of a payline, one on each of the five reels. The wins for the symbols aren’t all the same. From the least valuable symbol (gives smallest wins) to the most valuable symbol (gives biggest wins), the symbols are: 9, 10, Jack, Queen, King, Ace, the flower, the bird of paradise, Eve and Adam. Both Eve and Adam are naked, just like in the myth! They both look very fit so there’s something for both men and ladies to look at this slot. Although, you don’t see all of them, if you know what I mean! Novomatic is a good developer for giving out Free Games. Many of their slots have a Free Games feature. Their simpler slots don’t tend to but the majority of their video slots do. To win the Free Games, you’ll need 3, 4 or 5 Scatter symbols to land on the reels in one spin. This Scatter symbol shows a green serpent wrapped around a delicious-looking red apple! This symbol gives the same payouts as Adam but it doesn’t have to follow the normal payline rules. What’s cool about this Scatter is that it can also act as the Wild symbol and substitute for any other symbol if it will complete a winning combination by doing so. This symbol takes inspiration from the snake who, according to legend, encourage Eve to commit sin by picking the apple from the Tree of Knowledge. As a result, Adam and Eve were banished from the Garden of Eden and humanity has had to live with the consequences ever since! At the beginning of the Free Games feature, you will be asked to choose an apple. The apple you choose will reveal the special symbol for the Free Games. This symbol will gain the ability to expand and multiply your wins! Instead of just taking up one position, if the conditions are right, the symbol will expand to cover all three positions of the reels it lands on!